The first snow is lying as I write this with more forecast. As well as looking forward to exploring the hills on skis and snowshoes I’m also hoping to spend some nights this winter in snow shelters. Sleeping in the snow seems unusual but it is actually the warmest and safest way to spend nights out in the winter mountains. Snow has amazing insulation properties and snow shelters are warm, windproof and quiet. They don’t blow down; keep you awake by rattling in the wind or snow inside as frozen condensation falls from the roof. They are roomier than most backpacking tents too as you can dig out sleeping platforms and kitchen shelves and have room to sit up and spread your gear out. I first discovered snow shelters many years ago on a winter mountaineering course that offered a night out in one. Setting out with overnight gear, but no tent, we found a steep snow bank high on the slopes of Aonach Beag, dug into it and then opened up our little slot into a roomy cave. 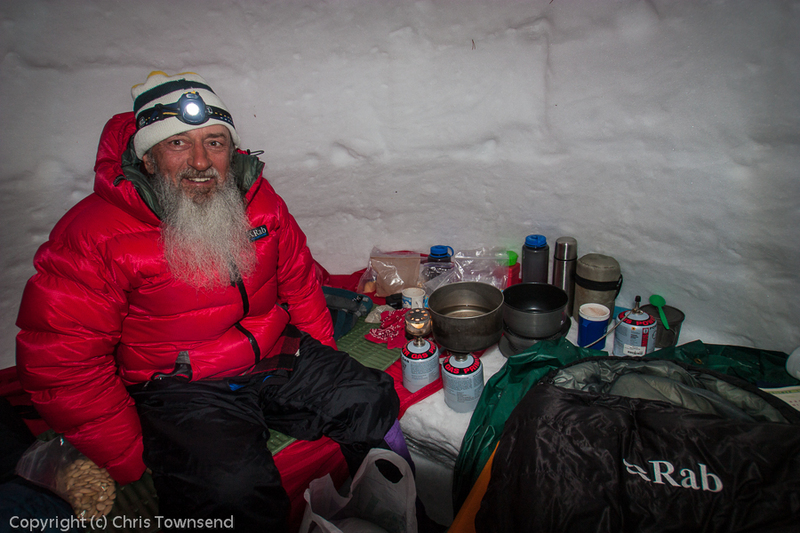 Once inside we spread out our bedding, set up the stove and made dinner. It all felt very civilised. After spending a comfortable night there I was hooked. The weather was fine though so I didn’t gain any sense of the security provided by a snow shelter. I was just impressed by the space. Later that same year, on a ski tour in the Cairngorms, I was to learn the big advantage of snow shelters when I woke after a night in another snow cave. Pushing my way through the surprising amount of snow that had built up against the rucksack that was acting as a door I climbed out into a blizzard. Visibility was almost nil; the ground and sky a swirling mass of snow. The wind almost blew me off my feet and I soon retreated to the calm and quiet of the snow cave. The storm lasted all day and, apart from one short venture out when we almost failed to find the cave again (this being long before the days of GPS) even though we didn’t leave the corrie it was in, we spent the day in the snow cave reading, making hot drinks and relaxing. I knew from nerve-wracking experience that being in a tent in that storm would have been unpleasant to say the least. We would probably have packed up and descended to calmer conditions. Years later when I worked as a ski tour leader, mostly in Norway, I taught shelter building and realised that many people thought sleeping in the snow was a very strange thing to do and that for some it was quite challenging. We built the shelters near to huts so people could choose to sleep in them or not and could retreat to the hut if they didn’t like it. Not everyone chose to sleep in a snow shelter. However I think everyone realised just how useful the skill of building a shelter could be in an emergency. On all the tours I led this occurred just once, high in arctic Norway, when avalanche danger during a big storm made it too risky to descend to the hut that was our intended overnight destination. We were carrying two small tents as some of the huts were quite small but these could only squeeze in six of our group of ten so we built a snow dome for the rest of us by heaping up a huge pile of snow and then hollowing it out. That night the temperature fell to -25ºC as the storm faded away and the sky cleared and we emerged to sunshine and an easy ski down to the hut for breakfast. My enthusiasm for snow shelters was rekindled a few years ago on a trip to Yellowstone National Park with Ed Huesers, inventor of the Ice Box igloo building tool. With this ingenious device igloos can be built from any type of snow including powder. On our five day trip we built two igloos, which we used as bases for exploring the surrounding wilderness. Night temperatures were all below -20ºC yet the coldest temperature in an igloo was -7ºC. On the coldest night we stood outside as light snow fell and the moon rose listening to the crack of branches snapping as the sap in them froze. The temperature was below -30ºC. Yet whenever we felt chilly we could nip back in the igloo and warm up. 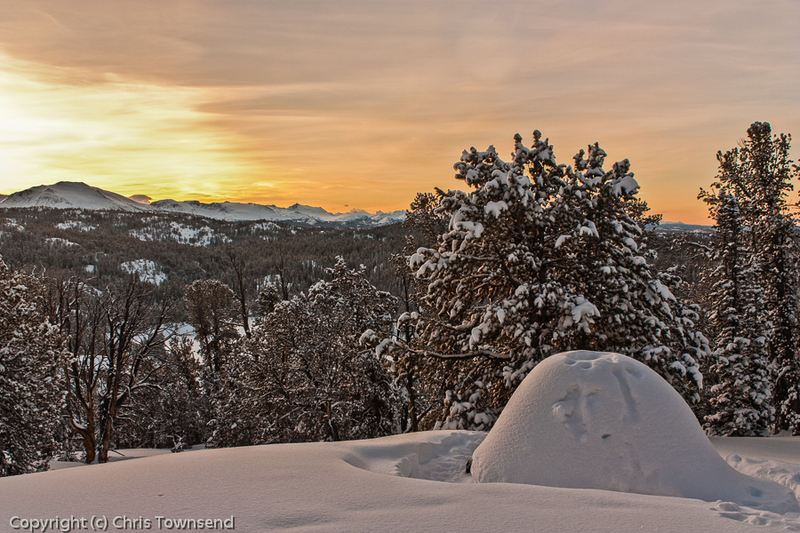 On further trips I’ve explored Yellowstone again and the Wind River Range to its south, using igloos throughout. On none of these trips did we even carry a tent, just the Ice Box and snow shovels. The last two years I’ve built igloos on the Moine Mhor in the Cairngorms with members of the Inverness Nordic and Ski Touring Club. Last January we constructed two igloos on the slopes of Carn Ban Mor. The sun was out and the weather, though cold and with a brisk wind, was pleasant and we were hoping for a good long ski tour the next day. However, after a comfortable night, we woke to a white-out and a strong wind. Instead of swooping across the white expanse of the Moine Mhor we struggled to pack up our gear and then navigate to the edge of Glen Feshie. Only when we were part way down to the glen did we escape the blasting spindrift. Yet in the igloos we had been warm and comfortable. Tents would have been uncomfortable, if indeed they had stayed up. Whilst building an igloo takes several hours and requires at least two people simple snow shelters can be made quite quickly by one person. If there’s much snow on the hills I always carry a snow shovel and have occasionally dug a small slot in a bank for a lunch stop out of the wind. One day I’ll hollow one of these out a bit more and spend the night there. THat's a very nice photo of Igloo Ed. Your description of the comfort of igloos makes one want to try it out. Never done it before. Your post makes it interesting and challenging to try it out. It will probably be next on my list this season. Where Has All The Snow Gone?